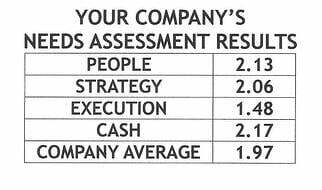 If you’ve read Good to Great you know that Level Five Leadership is the highest level of leadership that is a requirement to attain a “Great” company. 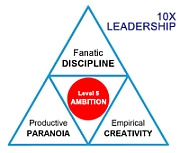 A picture describing the levels of Level Five Leadership is offered in The Shadow of Leadership. Yet if these were the true descriptions of these leaders no one would work for them, nor would they be able to build the successful organizations they have. Why do people follow them? Why would anyone want to work for someone with Level Five Ambition? Because they have a deeply attractive form of ambition. 10X leaders channel their ego and intensity into something larger and more enduring than themselves. They’re ambitious for a purpose beyond themselves. It could be building a great company, changing the world or achieving some great objective that is not about them. 10Xers are incredibly ambitious, but their ambition is first and foremost for the cause, for the company, for the work, not themselves. In Good to Great the focus was on the humility of Level Five leaders. In Great by Choice it’s on the ferocity of their will. 10Xers aim for being much more than successful. They don’t define themselves by money, power, or fame. Instead they define themselves by impact, contribution and purpose. So if this is what Level Five Ambition looks like, do you want to have a piece of it. Do you wish to be like these leaders, grow your business to greatness achieving Level Five Ambition? If you’re interested in aspiring to be a Level Five Ambition Leader, a 10Xer, the caution here is that Great by Choice does not answer whether or not one can develop the characteristics to be one. They did cite examples of several Level Five Ambition leaders who did not display this type of behavior at the front end of their careers, yet upon gaining leadership they followed the habits discussed in Great By Choice. George Rathmann a 10Xer at Amgen floundered at Litton, yet displayed his leadership genius. Herb Kelleher, Southwest Airlines made terrible decisions early in his career. Peter Lewis, Progressive Insurance, made enormously costly errors early in his career as well. Great by Choice advice on developing Level Five Ambition to become a 10Xer: get to work learning and applying the practical lessons of how 10ers lead, building a truly great organization that delivers superior results, makes a distinctive impact and achieves lasting endurance. Fanatic Discipline: 10Xers display extreme consistency of action – consistency of values, goals, performance standards, and methods. They are utterly relentless, monomaniacal, unbending in their focus on their quests. Fanatic disciplineis not the same as regimentation, measurement, obedience to authority, adherence to social stricture, or compliance with bureaucratic rules. True discipline requires mental independence, and an ability to remain consistent in the face of herd instinct and social pressures. Fanatic discipline often means being a nonconformist. Empirical creativity: When faced with uncertainty, 10Xers do not look primarily to other people, conventional wisdom, authority figures, or peers for direction; they look primarily to empirical evidence. They rely upon direct observation, practical experimentation, and direct engagement with tangible evidence. They make their bold, creative moves from a sound empirical base. Empirical creativity gives 10Xers a level of confidence that, to outsiders, can look like foolhardy boldness; in fact , empirical validation allows them to simultaneously make bold moves and bound their risk. Being empirical doesn’t mean being indecisive. 10Xers don’t favor analysis over action; they favor empiricism as the foundation for decisive action. Productive paranoia: 10Xers maintain hyper vigilance, staying highly attuned to threats and changes in their environment, even when – especially when – all’s going well. They assume conditions will turn against them, at perhaps the worst possible moment. They channel their fear and worry into action, preparing, developing contingency plans, building buffers and maintaining large margins of safety. Productive paranoia enables creative action. By presuming worst-case scenarios and preparing for them, 10Xers minimize the chances that a disruptive event or huge piece of bad luck will stop them from their creative work. Underlying the three core 10Xers behaviors is a motivating force: passion and ambition for a cause or company larger than themselves. They have egos, but their egos are channeled into their companies and d their purposes, not personal aggrandizement. Positioning Systems and Gazelles Coaching are based on the Rockefeller Habits and many of these best practices from Jim Collins books. Strategic Discipline builds foundational habits that produce the Level Five Ambition 10Xers follow. Contact us if you’re interested in developing these routines for growing your business. We’ve examined Level Five Ambition and Fanatic Discipline. We’ll look at 10Xer’s Empirical Creativity and what it means next blog.